AP32 on mitmeotstarbeline ja lihtne kasutamisel testtelefon telekom spetsialistide jaoks. See oli välja töötatud kasutajatega kostöös, et täita nende igapäevased nõuded. Koos AP32ga, kasutaja ei pea võta kaasa palju individuaalsed seadmed. Samuti, AP32 on kompaktne ja odav. With AP32, the user does not need to carry several individual devices. Yet AP32 is compact and inexpensive. To switch AP32 from telephone to line monitor mode, or from DSL tester to signal generator mode, just use the simple keypad shortcuts. The LCD display shows active mode and essential settings all the time with its large characters and informative symbols. CI (communication identification) mode is the basic test mode for monitoring lines without causing interference. It shows the line voltage and possible frequency clearly on LCD and helps the technician to define which type of line is at hand, such as POTS, ISDN, or xDSL. The DSL test mode is an extended monitor mode for checking especially DSL lines. Besides showing voltage and frequency, DSL test makes high frequencies audible, which helps the user to recognize active DSL lines or, for example, to tell whether a DSL modem is sending a handshake signal. AP32 also includes an unbeatably fast DSLAM test: just press OK during DSL test and AP32 will tell within a few seconds whether there is an ADSL or VDSL DSLAM on line or not. No more waiting with a laptop and modem! In telephone modes AP32 uses an integrated ADSL/DSL filter to minimize interference to DSL lines. Calling over a POTS line with the AP32 is as easy as using a mobile phone: Choose a name from the phone book, redial a number from the redial list, or manually dial a number and press off-hook. If the AP32 is off, it will wake up to an incoming call and give a ring tone. Furthermore it will tell the caller ID number with DTMF or FSK protocols. AP32 works as a field phone as well. Using the LB-mode over a cold pair is very easy: just connect, press off-hook and start talking. You can even use DTMF tones in LB-mode for testing or programming certain equipment. AP32 also supports monitoring of the security messaging protocols widely used in the security & alarm systems. Supported protocols include SIA® standardized 300 bd FSK ("SIA"), Ademco® Contact ID, most common pulse formats and generic DTMF of telephone dialling. AP32 can monitor and display both the transmitted messages & data and the received handshakes and acknowledgement signals. Check line status - See the line voltage before a call and check that the loop current is within limits during a call. Pair tester - Test the approx. resistance of a pair to find out if the pair is open, shorted or low-ohmic. Monitor dialing - In CI mode monitor all DTMF codes sent by a terminal equipment, such as telephone dialing sequence. Signal generator - Use the AP32 as a signal generator to produce specified frequency between 0.1kHz and 99.9kHz on three alternative levels. 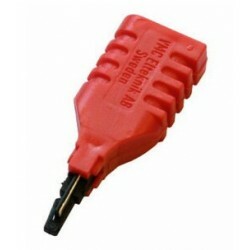 AP32 has a standard RJ45 connector which enables changing test cord easily. The AP15B cord has banana plugs which allows using various adapters. The AP15RJ cord (accessory) fits directly to both RJ11 and RJ45 sockets. DPP4 protective case (accessory) protects AP32 from dirt and has a wrist strap. AP32 has built-in over-voltage protection mechanisms to protect the device and minimize interference to telecommunication. HM12 headset (accessory) allows hands-free use and makes working in a noisy environment easier. AP32 uses a standard low-cost 9V battery. It has low battery consumption and automatic switch-off. Software is upgradable, which allows menu language and basic settings to be customized. Furthermore, Vesala offers efficient service and customer support. AP32's new firmware supports monitoring of the security messaging protocols widely used in the security & alarm systems. When AP32 is connected parallel with the telephone line of an alarm equipment, it can monitor and display the transmitted messages data as well as the received handshakes and acknowledgement signals. AP32 does not take part in the messaging nor does it interfere with it. Supported protocols include SIA® standardized 300 bd FSK ("SIA"), Ademco® Contact ID, most common pulse formats and generic DTMF of telephone dialling. Active format can be chosen using the menus. In the example below there is an SIA message transmitted by an alarm device. <OK> tells that the message is formally correct. In case of an interrupted message a <BREAK> message will be displayed and in case of a parity error, AP32 will display <ERROR>. Browsing to screen 2/3 displays the account ID code of the alarm device and the area ID by which the alarm was caused. Screen 3/3 shows that the cause was burglar alarm in zone 01. Pulse formats are mostly used with older alarm devices and central stations. AP32 supports their most common pulse speeds from 10 to 40 characters per second. Below there is an example of a pulse coded alarm message triggered by tamper sensor. This example shows a formally correct Contact ID message from a device with ID 4502. Cause is again burglar alarm. The message can be browsed back and forth just like an SIA message. Some alarm equipment and many others use generic DTMF for messaging through the telecom network. AP32 displays these number coded messages just like telephone dialling, hence numbers are also aligned to the right, as seen in the example below. Ekraan Large 2-line alphanumeric LCD with symbols and backlight. Klaviatuur Silicon treated rubber 21 key keypad with tones. Ühendused Line connector: RJ45 (includes interface to pair 1 and pair 2), Headphone connectors: 2 pcs. 3.5mm stereo jack (for 32ohm headphones). Patareid 1 pc. 9V alkaline battery 6LR61 or similar rechargeable battery. LSA/BNp adapter connects a test equipment with 4mm banana plugs to Krone LSA Plus terminals by breaking (disconnecting) the pair. 1. Testtelefon AP32, 1 tk. 2. Telefonijuhe AP15B (1.5m, RJ45/2 x 4mm banana plugs), 1 tk. 3. Kasutusjuhend Inglise, Soome, Rootsi, Eesti või Vene keeles, 1 tk.